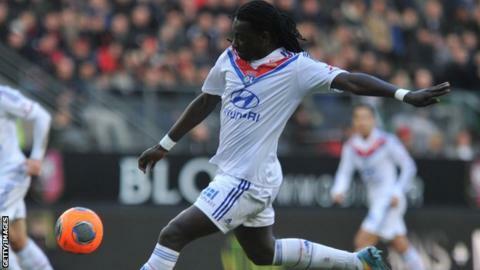 Bafetimbi Gomis has scored almost one goal every two games in the league for Lyon. Swansea City boss Garry Monk says the signing of French striker Bafetimbi Gomis is a "very big" signing for the club. The 28-year-old has signed a four-year deal with the Swans after leaving Lyon. Gomis, who was out of contract at the French club, scored 56 goals in 120 league appearances during his five-year spell with them. "It's a fantastic signing; a very big and important signing for the club," said Monk. Gomis is Monk's second signing since becoming manager at the Liberty Stadium. His first was a deal to secure goalkeeper Lukasz Fabianski from Arsenal who was also out of contract. Monk told the club's website that he is delighted to have secured Gomis. "I'm very happy," he said, "You are talking about a quality striker who has played international, Champions League and top flight football in France for a big club. "It shows just how far we have come that we can attract a player of his quality. "He's a player that can excite the crowd, make and score goals. He's always done that wherever he's been - and that's what we want him to keep doing here. The 12-times capped Frenchman made his last appearance for Les Bleus in their 3-0 friendly defeat by Brazil in September. Monk said he has spoken to the striker at length and has also been impressed by the his attitude. "He came across as a very good guy," said Monk, "humble, hard-working and honest. "He is determined to come here and do well. He asked a lot of questions about the squad and the strengths of the players. "He wants to settle into the squad as quickly as possible and do well on the pitch.